Whilst on a routine training mission, the USS Enterprise under the command of Captain Spock received message from the Regula 1 Science lab which was testing the classified Genesis project. It was discovered that the message was being jammed, and Admiral Kirk, who was aboard the Enterprise requested that Starfleet send a ship to investigate. Unfortunately, there were no other vessels in the vicinity, and the Enterprise, despite being crewed mostly by cadets, was ordered to proceed to Regula 1. Whilst on route, the Enterprise happened across another vessel. This turned out to be the Miranda-class USS Reliant, who for some reason refused to answer hails. Reliant starts from left side, Enterprise from the right, both vessels speed 5. No one has shields or weapons armed. Enterprise may not raise shields or arm weapons until the turn after the Reliant has done so. 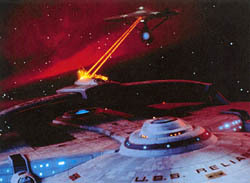 If the Reliant closes within 10 hexes of the Enterprise, the cadet crew reminds Admiral Kirk of General Order 12 (Rules of Engagement), and the Enterprise may raise shields. The Enterprise may not fire until the turn after the Reliant has for the first time. A vessel is considered disabled if its impulse thrusters and a warp nacelle are destroyed, and if its medium phasers and torpedoes are offline. Phasers go offline if the warp nacelles are damaged due to a new design concept. Starfleet: The Reliant must be driven off or disabled whilst the Enterprise must remain mobile. A major victory is won if the Enterprise is disabled and the Reliant mobile. A minor victory occurs if the Enterprise is destroyed. The Enterprise and Reliant closed in on each other. Lt Saavik reminded Admiral Kirk of General Order 12, but he ignored her. The Reliant sent a message saying that it had problems with its communications array, which gave them enough time to close within point blank range of the Enterprise. When the Reliant raised shields and targeted phasers, Kirk ordered the shields raised, but it was too late. The Reliant opened fire, causing damage to critical systems leaving the Enterprise without even auxiliary power. Then the Reliant hailed the Enterprise, and Kirk saw the face of his nemesis, Khan. Khan demanded any information on project Genesis, but Kirk feigned helplessness, pretending that the Enterprise was heavily damaged (which it was). Khan allowed Kirk a minute to recover the data, which was enough time to recover the Reliant command prefix codes and charge phasers. When Khans deadline arrived, Kirk used the prefix code to lower the Reliant’s shields, allowing the Enterprise to get in a few shots of her own, disabling the Reliant’s weapons and forcing Khan to withdraw.